Celebrating the free spirit of the 1960s and 1970s, the Extremely Piaget collection recalls an epic period of creativity and innovation in the history of the Maison, marked by an explosion of colour and new shapes, and enhanced by the most precious materials: diamonds, colourful stones and exquisite gold. During these happy years, with its bold creations, Piaget established itself as the brand of choice for celebrities and the international jet set who enjoyed the glamourous life on the French Riviera, and regularly frequented its extraordinary parties, some hosted by Mr Piaget himself. Finding inspiration in its rich heritage, the new Piaget Mediterranean Garden collection brings a contemporary twist to the captivating lifestyle of the Riviera with its elegant festivities and stylish fashions. Elaborating the intricate connection of brilliant stones and complex gold techniques, Piaget Mediterranean Garden’s designs are an authentic surprise for the sophisticated modern woman, embodying the distinctive elegance associated with Mediterranean living since the 1960s. With the same boldness that captivated the most stylish personalities of the era, Piaget Mediterranean Garden brings to life the beauty of blooming roses, palm trees and shimmering waters in a style that is uniquely « Piaget», masterfully combining the fine art of goldsmithing and the expertise of gem-setting to create seductive pieces. The Piaget Rose, inspired by Yves Piaget’s passion for the queen of flowers, is joined by creations with their many surprising shapes, colours and textures. The precision and artistry with which the gold is shaped and woven, and with which the gems are set infuses each jewel with great depth and sparkle, like a secret garden filled with rays of sunlight or the delicate beams of a coastal moon. With Paraiba tourmaline and blue sapphires elegantly reflecting the blue of the deep sea waters, the untameable French Riviera lifestyle is fully staged. 18k Pink Gold Ring, with 1 oval-cut green-blue tourmaline (18.74 cts), 382 brilliant-cut diamonds (6.49 cts) and 7 drop shaped green tourmalines (1.96 cts). 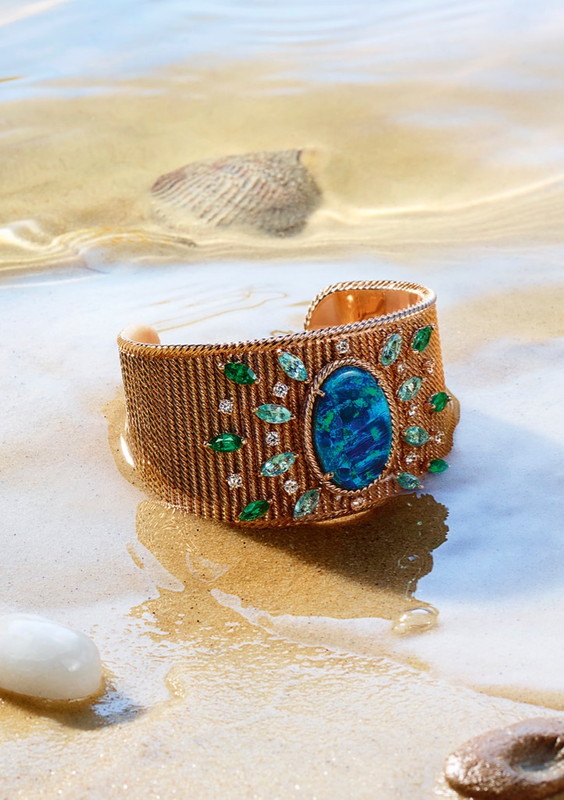 18k Pink Gold cuff, with 1 oval-cut black opal (14.82 cts), 8 marquise-cut blue tourmalines (2.88 cts), 6 marquise-cut emeralds (1.86 cts) and 12 brilliant-cut diamonds (0.73 cts). The collection is characterised by two jewellery techniques – twisted goldsmithing and marquise-cut stones – expertly mastered by the Maison. Made popular in the 1960s and 1970s, Piaget has continued to evolve them, developing increasingly complex methods to reach new heights in perfection. The Twisted Gold cuff illustrated below is created using a single gold wire, rather than two, twisted upon itself. Achieving the helical pattern with such a thin thread demands precision and patience from the jeweller, who then cuts it into small segments and solders it on the gold band of the bracelet without a single trace of the welding to be seen. Both the border of the bracelet, as well as the prongs holding the diamonds are created from twisted gold. This unique setting technique gives the impression that the stones are delicately floating on the delicately polished surface of the bracelet. 18k Pink Gold cuff with 8 marquise-cut diamonds (4.87 cts), 1 coussin-cut diamond (3.03 cts) and 8 brilliant-cut diamonds (0.37 cts). First commissioned by King Louis XV to emulate the seductive smile of his mistress the Marquise Madame de Pompadour, the marquise-cut tells a poetic and sensual symbolic that perfectly suits Piaget’s femininity. Necklace in 18k White Gold, with 224 baguette-cut diamonds (44.82 cts), 45 marquise-cut diamonds (14.78 cts), 3 coussin-cut emeralds (7.66 cts), 3 coussin-cut green tourmalines (6.85 cts) and 2 marquise-cut emeralds (1.86 cts). Due to its shape and facets, inclusions and colour are more visible than in other types of cut, requiring Piaget’s gemmologists to source the best clarity and colour for all its marquise-cut diamonds, a process that can take over 6 months. Respecting the codes of the art of gemmology, perfect symmetry of the cut is required to maximize the stone’s face up beauty and contrast brilliance. The marquise-cut gives diamonds a very particular sparkle. The use of this cut has been a classic in Piaget High Jewellery since the Maison’s early beginnings as a master-jeweller. Only once the best stones have been identified can the virtuosity of Piaget gem-setting begin, each stone placed with the greatest precision around the watch, creating a laurel wreath as a powerful symbol of victory and glory for the woman wearing the timepiece. 18k White Gold Watch. Case set with 52 marquise-cut diamonds (7.88 cts) and 4 brilliant-cut diamonds (0.18 cts). Mother-of-pearl dial, quartz mouvement Piaget Manufacture 56P. White satin strap, buckle déployante set with 39 brilliant-cut diamonds (0.16 cts). Native to the Mediterranean region, the aromatic laurel with its glossy and broad leaves is transformed in diamonds and gold. As the marquise-cut releases the fiery sparkle of the stone, radiating from the centre towards the two ends of the navette, the crown of diamonds that surrounds the dial shines in such a way that the case disappears. The uniquely tapered shape gives this kind of diamond a very particular movement, facilitating the seamless juxtaposition of the stones in a circular shape to create generous volume, while keeping the appearance of the watch light, feminine and delicate. In a world of fragrant fantasy and floral beauty, the feminine rose in gold and diamonds continues to enthral. Inspired by the leafy and luscious gardens overlooking the Riviera, with their palms, laurels and roses, the Piaget Mediterranean Garden seduces with its elaborately textured gold, marquise-cut diamonds and its explosion of colourful stones. Post edited by Claudia Carletti, Jewellery Through Time. All material courtesy of Piaget.